"Camberwell crash death: Sixth cyclist killed in two weeks"
"We are in a situation where we have seen an unprecedented number of deaths in such a short period of time." It's personally tragic news for some and worrying news for many more. This week we learned of another cyclist fatality on London's roads, the sixth in the space of a fortnight. The Mayor of London is already facing questions over whether the local authorities are doing enough to ensure the safety of cyclists and whether London's roads are really getting safer. But is the latest wave 'unprecedented' as some campaigners have recently claimed? The annual cycling casualty figures from Transport for London suggest not. The recent six deaths bring London's death toll for this year to 14 (as TfL confirmed to us today). In 2012 the total was 14 for the entire year, while there were 16 in 2011 and 10 in 2010. There tend to be fewer cycling deaths in the winter months anyway, so this year's end total looks likely to be similar to the last few years. But, as others have already pointed out, it's not enough to look just at total fatalities. 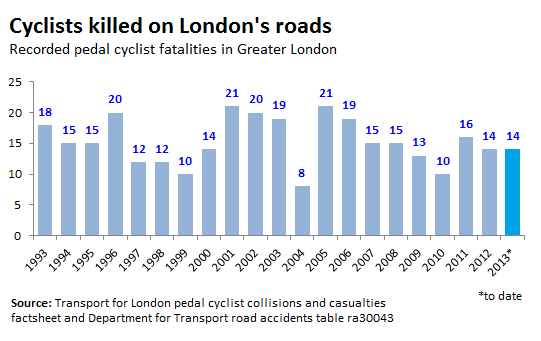 More and more cycle journeys are taking place in London, so to some extent we might expect more accidents as a result (although some theorise that eventually 'safety in numbers' means cyclists will be safer overall as other road users get used to them being around). We can look at the fatality 'rate' per million 'journey stages' (part of someone's 'trip' from A-B that takes place on a bicycle). This shows a broadly downward trend in deaths relative to journeys since 2001. 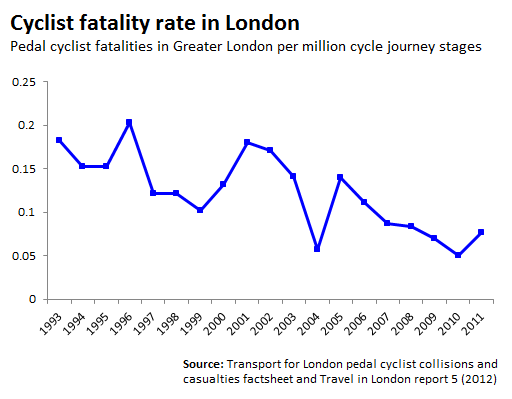 In other words, death is becoming less likely per cycle journey in London. But is a cluster of six deaths in two weeks unusual? It's certainly high - if six cyclists had been killed on the road every two weeks for the past three years the death toll would total over 600 since the start of 2010. In reality 44 have died since that date. So yes, the recent cluster of deaths is unusual, no other spates come close to this one, but as yet it hasn't been an unusual year.